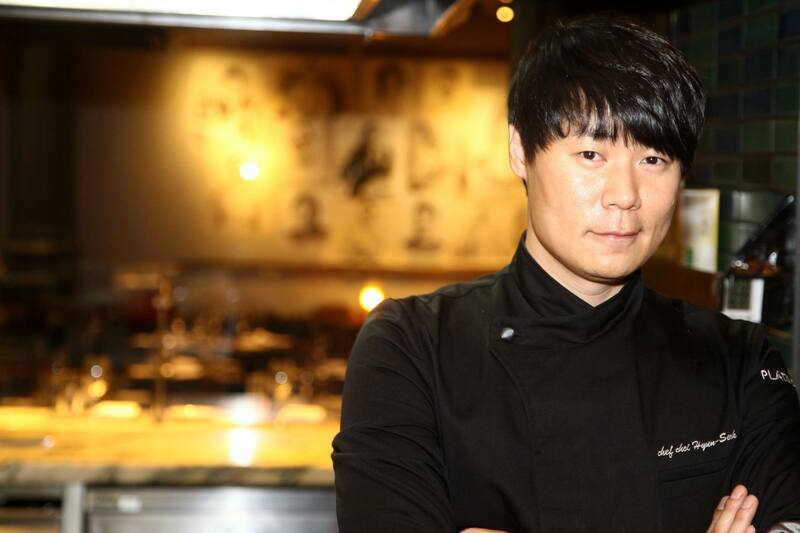 Chef Choi Hyun Seok is apparently now better known in Korea as a tv personality than as a chef – but in New York City, he showed with his cooking how he became a star. Opening with a meat-filled macaroon and a cream-filled cacao ball that resembled a tomato, Chef Choi alerted the crowd: his food is whimsical, European-influenced, not traditional Korean. A home-made butter candle with bread reminded that this chef grew up in one of Seoul’s top Italian restaurants (his instagram handle is @crazypenne). A lobster salad launched the tasting menu with strong truffle flavors that faded into mild honey sweetness and lingering lemon. As in all but one of his savory dishes, the sea was present. Umami is critical to his chef’s view, popping up in almost every dish. Chef Choi’s scallop got my vote for trickiest dish of the night. To the eye, it was a white cake topped with ice cream and sprinkles. Closer examination revealed a radish base, encasing a scallop; cheese espuma and smoked salmon ice cream as frosting; caviar sprinkles. A spicy kick added a small Korean touch. As he noted, before he cooked Italian, he cooked Korean with his mother (also a distinguished chef, as are his father and brother). An abalone course arrived with drama and apologies: Chef Choi didn’t like the texture. Opening the salt bun in which it was cooked revealed thick slices of abalone, more scent of brine and hints of perilla kimchi. I’ve certainly enjoyed more tender abalone preparations – but the green pepper spices and the jerky-like texture made this a perfect bar snack. Chef Choi’s linguine course perhaps best showcased his Italian-Korean-Molecular reputation. Edible yellow pixabay flowers from Chejudo topped crunchy fried seaweed, made to look like pasta but have the texture of cereal. The result was amusing, umami-packed, a bit dry in the mouth, lots of fun to eat: another perfect snack for a very clever tapas bar. Watching him prep it doubled the fun: he’s intense, tall, athletic – and every once in a while, stops to smile at the crowd. He’s a showman. A sea bass course made me rethink a fish I eat often. Three accompaniments – soy butter, yuzu foam and berry vinegar, served at different spots on the plate – pulled very different flavors and textures from the smoky fish. I favored the earthy soy butter’s creaminess, with a dash of tangy berry – but happily closed with a bracing blast of yuzu acid. Chef Choi closed the savory courses with the highlight of the night, a perfectly-grilled steak topped with heritage doenjang butter. As the butter melted, the briny fermented soy spread a big gamy flavor across the meat, like a liver mousse. This was perhaps the most Korean flavor of the evening, and a fitting close, in that fermentation was the core driver of flavor. We often err, in NYC, in thinking of the spice and salt of kimchi as the essence of Korean flavor – but it’s the process of fermentation – shown beautifully in this doenjang – that really sets Korean food apart. Chef Choi closed the meal with a deconstruction of a traditional Korean dessert. Dried persimmon surrounded yuzu sorbet and Korean pine nuts. Citrus tanginess dominated, with hints of sweetness and the woods highlighting. The evening closed with a long line of photo- and autograph-seekers. Chef Choi chatted, posed and, with the longest arms in the room, orchestrated most of the best selfies. Charming and humble, he confirmed his status as a star.